There’s no doubt that soccer is a great team sport for getting out there and active, boosting your fitness and socialising at the same time. However, soccer can put you at risk of injuries to the feet and ankles, and you should be aware of the types of foot pain that you may be likely to experience. These conditions may all be very painful, and may prevent you from participating in sport for some time, so any measures you can take to prevent injuries such as these from occurring will be helpful. 1. Take care of your feet. Be aware that your feet are doing a great job, supporting and carrying you all day long. If you’re making unreasonable demands of them, they may suffer! Be sure to take time out to rest your feet and to treat them with a little TLC to say thank you for their efforts. 2. Wear good soccer boots or training shoes. Choose soccer boots or training shoes that will give your feet good support in all the right places and will not put pressure on the muscles or bones. Good arch support is vital to prevent fallen arches, or flat feet, and cushioning will help to reduce the risk of developing plantar fasciitis. Visit a specialist shoe store such as Foot Solutions to find arch supports to put in your sport shoes. That will keep your feet feeling great while you’re on the pitch. 3. Don’t ignore foot pain. 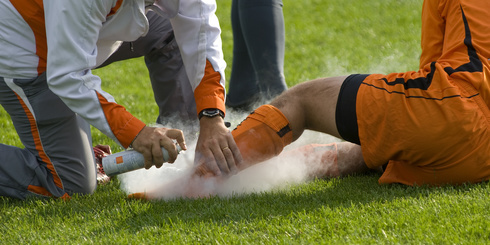 If you experience pain or an injury during a soccer game, don’t ignore it and play on. If you continue to put pressure on an injured foot you are likely to do further damage if you do not get your feet checked by a medical professional as soon as possible. To try our large range of comfortable and stylish sports shoes, pop in and talk to our friendly and helpful team at Foot Solutions. We will be happy to help you to find the best options for you and your feet, so that you can stay on the pitch for longer!